A new novel by Gay Gavriel Kay is something that I (and Elio) always look forward to with eager anticipation. We have been fans of his writing since the Fionavar Tapestry, which remains my favourite work of his (indeed, it may be my favourite fantasy series of all times) even though the later novels undeniably are more polished. There’s something about the rawness of the Fionavar Tapestry that always gets me. Of course, it is also a much more traditional work of fantasy than any of his other later novels (save for Tigana) and I am, first and foremost, a reader of fantasy. At the heart of my love for the story, together with the vivid characters and the strong emotions their fates elicit, are the intertextual elements. These fill the story with so much resonance for me since Arthurian legends and mythology (especially Greek, Nordic and Celtic, the latter two featuring prominently in the trilogy) was what led me to reading fantasy in the first place. Still, even though the trilogy has a special place in my heart, I am very fond of almost all of Kay’s later novels as well. The only one that does not loom as large in my mind is Last Light of the Sun; though its setting is very evocative and meaningful for me, something in the novel keeps me at a slight distance. The writing is fitted to the setting of the novel, a diminished world, no longer so ornate and beautiful as what has been lost. Ultimately, it did not engage me emotionally to the same degree as most of the other novels. 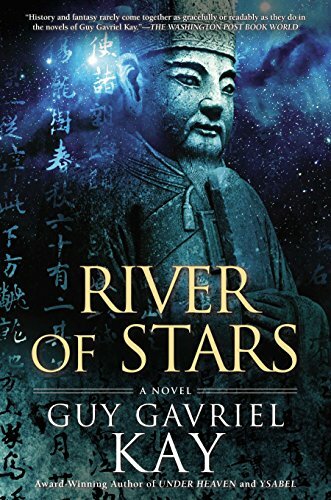 River of Stars, Kay’s latest novel and the second to be using a setting closely based on Ancient China (the first being Under Heaven), has—unfortunately, because I want to fall desperately in love with each of his novels—left me with a somewhat similar reaction. Before delving deeper into this, I do want to stress that a large part of my reaction has to do with my personal preferences rather than any fault in the writing; a beautifully written book might engage my mind but still not engage my heart to the degree that I would like and then my enjoyment will be somewhat lessened. Still, I think that there are some small issues with the book that could be construed as more objectively difficult. As I try to provide a short summary of the book to begin with, I hit upon one of these issues. I found that for a surprisingly long stretch it was very hard to grasp where the story was going. Characters were being introduced, connections established, but unless you are familiar with the history that inspired the novel—this is an aspect I will return to later—you are left wondering where everything is heading. I do not mean to say that a story needs to make its intentions perfectly clear from the start, or that it needs to be action-packed, but I felt that the period of uncertainity went on for a little too long. It took relying on my trust in Kay as an author to proceed and this did pay off; the latter half of the story, once the various threads begin to converge, engaged me much more. But I am not sure I would suggest River of Stars as an introduction to Kay. River of Stars takes place some 350 to 400 years after Under Heaven, corresponding to the Song dyntasy in the same way that the previous novel corresponded to the Tang dynasty. In a sense, River of Stars is to Under Heaven what Last Light of the Sun is to the Sarantine Mosaic duology; it takes place in a world where much of the grandeur and beauty of the past has been lost and where many still lament this loss. The events of Under Heaven have also shaped some of the foundations of the story in River of Stars; the army is still not trusted—if one popular military commander could start a rebellion, why not another?—and military prowess is no longer seen as an honorable quality to possess. Kitai’s army, therefore, is poorly led and poorly trained. They have lost much land to the leading steppe-tribe, the Xiaolu, and yet some—but not very many—still dream of reclaiming that land, of restoring some of Kitai’s former glory. That is the backdrop for the story, where the chief protagonists are Ren Daiyan, a young man who is one of those dreamers, and Lin Shan, a woman whose father has educated beyond what is the norm for women. They are of an age and they both go against the norms of society, which among other things starkly illustrates how very little a woman needs to do to be a rebel compared to what a man can do. In addition to them, quite a large cast of characters are given brief—and not so brief—point of views in the story. Kay has always used this element to some degree, showing the story from different angles or showing how one life can affect—or fail to affect—the great events in the world. I come back to Last Light of the Sun, however, since I believe that is when he particularly made a point of these “vignettes” showing a small part of some person’s life where it intersects with the main story. I think that perhaps the first half of River of Stars might have benefitted from fewer of these digression, given my feelings that it was already somewhat unclear as to the path of the story. That said, there are some of these characters that I would not have wanted to miss the chance to read about; one of the most poignant moments of the story follows upon the heroic sacrifice (this is Kay, after all) of one of these relatively minor characters. Indeed, there are—as always with Kay—some exquisitly heart-rendering moments. The writing throughout the book certainly cannot be faulted; there doesn’t seem to be a word out of place, though I did find that the sentence structure and the shifts of tense contributed to the first half being somewhat difficult for me as I found myself considering the purpose of those elements rather than simply reading. Or perhaps I should say reading with my mind first rather than my heart, and that changes my relationship to the story. There is also a fragmentary quality to the language, images being built up piece by piece, just like the story is. At a guess—I do not know enough about Chinese writing to say for sure—Kay may have been inspired by Chinese stylistic elements; certainly, writing—especially poetry—is a very important part of the novel. But the style does—again, much like in Last Light of the Sun—contribute to my emotional reaction to the novel being less intense compared to with other Kay novels. Everything is very precise and very exquisite, but it is also quite delicate and understated. There’s a comparison in the book between the time of Under Heaven and the time of River of Stars; the former is likened to the peony flower, bold and bright, and the latter to the much more subtle and delicate plum flower. I do feel that is reflected in the form of the story and it probably has something to do with the characters not quite grabbing me as strongly as I am used to with Kay. In most of Kay’s other novels, there is at least one character that captures my imagination from the start; I found that these characters, more subtle and understated, took longer to warm to and never quite loomed as large in my mind as, for example, the principal cast of the Fionavar Tapestry or the Lions of Al-Rassan. But it may be that this is in part due to one of the key themes of the novel, which is how legends are formed; the characters in the novel will one day become legendary, but they are not presented to us as legendary already. Another element that affected my engagement with the story comes back to the inspirations for the story. Chinese history and Chinese culture are, by and large, quite foreign to me. I find it intriguing and interesting, but it does not resonate with me the way the elements that Kay used in the Fionavar Tapestry do. He does manage to create a resonance of a different kind where the story ties back to Under Heaven and even references the characters from that novel, but it isn’t quite enough. Under Heaven, on the other hand, largely worked better for me even though it, too, lacked a lot of resonance to histories and stories that I was already familiar with; the boldness of the story and the characters was one reason for this, the other was the horses. They were enough, on their own, to create one strong point of resonance to focus my interest on. Obviously, this is something that an author has no control over, but nevertheless I wanted to mention it, to illustrate where I am coming from as a reader. Ultimately, I think this is a beautifully written novel but perhaps it dwells a little too much on certain stylistic elements. It is a carefully rendered work of art, but it left me just a little cold. That is, I hasten to add, just a little cold compared to some of Kay’s other novels, an important qualifier considering how very much some of them affect me emotionally. But given the very reflective nature of the story, it may very well be that it had to be this way for the form and the content to work together. Certainly, the story lingered with me for a long while after finishing. Lu Mah’s death: How does Kay do it? We know each book will have at least one of these moments, and we’re awed by them each time. The moment of death is sad, but it is the last words and Lu Chen’s reaction to these that really hits you. The ending: Does Ren Daiyan choose to leave or to drink the poison? I am leaning towards the latter because of the fox spirit’s tattoo; gifts from spirits are always double-edged and since the reason he gave for denying her was his desire to restore the rivers and the mountains to Kitai (as opposed to his love for Li Shan), it seems to be that the tattoo could be seen as binding him to that. Thus, when his perceived destiny becomes impossible to due to politics, would he really have any choice but to die? Especially since his being alive might endanger what remained of Kitai? Of course, there’s the suggestion of Lin Shan going far, far west—which is where he came from—and having a son, but perhaps she went to meet his family? Perhaps she made the choice of having a son even without him, because she longed for a child—much like Alixana in the Sarantine Mosaic? But I don’t think we’re supposed to know for sure; that’s how legends work, after all. Parallells: So many things evoked thoughts of Kay’s earlier books. The wine glasses and the end, and the ambiguity, seems to have an echo of Lions of Al-Rassan. Lin Shan going away and eventually having a child reminded me of both Lisseut and Alixana. The meeting with the fox spirit could be seen as an echo of Dave and Ceinwen, perhaps also of the Riselka.